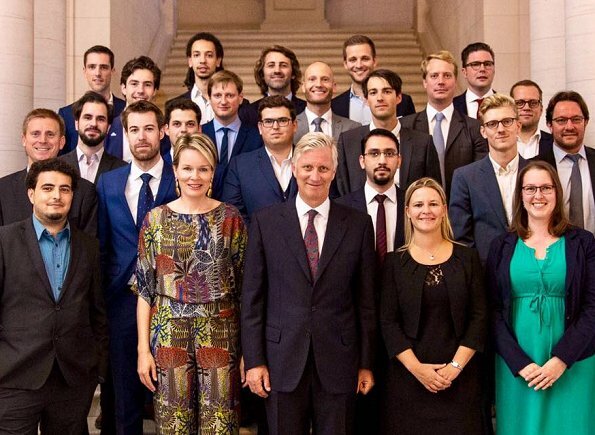 Yesterday evening, on September 7, 2017, King Philippe of Belgium and Queen Mathilde of Belgium held a dinner for Belgian Young Entrepreneurs (LJE-Les Jeunes Entreprises asbl) at Brussels Royal Palace in Belgium. Agree. Not Mathilde´s week at all this time. Queen Mathilde looks old for her age. She has worn this before and we didn't like it then either. Casual wear for a cruise not a dinner. Wow, great hairdo, youthful, modern, best ever, so I don't care what she wears! "Wow" for the hairdo, I totally agree! Me too. A very refreshing look, modern and youthful, a nice change to the usual 'always the same' hairstyle. Only good is hair. Rest is bad.